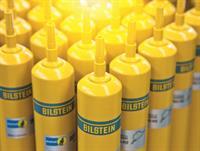 thyssenkrupp Bilstein of America Inc. is a company of thyssenkrupp Bilstein Suspension. Throughout the world, the name thyssenkrupp Bilstein Suspension stands for Innovation and high-tech solutions in chassis engineering. With its competitive chassis engineering solutions and with production facilities in Europe, North and South America, and Asia, the company supplies a complete range of damping and suspension products.